The postmillennial “lake of fire,” described three times in chapter 20, is not the same as the “lake of fire” depicted in chapter 19:20, 21 which consumed only “the beast” and “the false prophet” while “the remnant were slain with the sword of him that sat upon the [white] horse.” As we learned, that “lake of fire” took place during the time of the second trumpet depicted in Rev.8: 8, 9 leaving the remnant of the living wicked to call for “the mountains and rocks [to] fall on [them] and [hide] them from the face of him that sitteth on the throne, and from the wrath of the Lamb” (Revelation 6:16) at the time of the second coming that took place five trumpets and seven vials later. In contrast, the “lake of fire” portrayed in Rev.20:8-10, 14, 15 slew all “the nations which [were] in the four quarters of the earth” “the number of whom is as the sand of the sea.” They were called “Magog” after Satan, called “Gog,” gathered “them together to battle” against God seated above “the beloved city.” Consequently, the “fire [that] came down from God out of heaven . . . devoured them “ all and changed the entire earth into one molten mass. In the meantime, “the righteous . . . [who] had part in the first resurrection,” were like the passengers in Noah’s ark. They “abode safely in the holy city” as it rode out the fiery storm. After the purifying process of the fire has done its work, and the molten mass of the earth has cooled, God will commence the work of recreating it into “a new heaven (a new atmosphere called “the firmament” in Gen.1:7,)” “and a new earth” like it was before it was before Noah’s flood when there was “no . . . sea” as we know it”: “For behold (He says) I create new heavens and a new earth: and the former shall not be remembered, nor come into mind” (Isaiah 65:17). As the Commentary observes, the adjective “new” means “new” in quality as opposed to that which is worn or marred” and “created from the purified elements of the old . . .” with the “old” depicted here as “the first heaven and the first earth” which “were passed away” or vaporized in the “lake of fire.” Obviously, being subjected to heat sufficient to convert the earth into a sea of lava, water that composed the absent “sea,” would become a vaporous cloud hanging in the atmosphere or even ejected into outer space waiting for things to cool down. “The “sea,” that John says will be “no more,” is the one today that now “covers more than 70 percent of the earth’s surface. Since all the oceans of the world are interconnected, they can all be thought of as “one ocean” which originated when “the waters prevailed exceedingly upon the earth; and all the high hills, that were under the whole heaven, were covered. Fifteen cubits upward did the waters prevail; and the mountains were covered” (Genesis 7:19, 20). “The average depth of the oceans is 3,794 m (12,447 ft), more than five times the average heights of the continents.” While scientists generally believe the sea has always existed as it is, taking clues from the Bible, our vast ocean originated from “the fountains of the great deep [that were] broken up” (Genesis 7:11) at the time of the great flood. The source of those “fountains,” called “the great deep,” must have been a vast, subterranean ocean that was once underground but is now covering the major portion of the planet because they were “broken up” by the hand of God. Thus, what was once hidden below its surface, now lies exposed above the major portion of the planet as we now know it. The vain attempt of Gog and Magog to capture it is not repeated in this chapter. Instead, the cities’ descent from heaven that is likened to a beautiful “bride adorned for her husband” and followed by a description of what “the new heaven and [the] new earth” will be like, is the subject of this chapter. According to Zechariah 14:4, when the Lord’s “feet shall stand in that day upon the mount of Olives, which is before [ancient] Jerusalem on the east, and the mount of Olives shall cleave in the midst thereof toward the east and toward the west, and there shall be a very great valley; and half of the mountain shall remove toward the north, and half of it toward the south” evidently to provide space for “the . 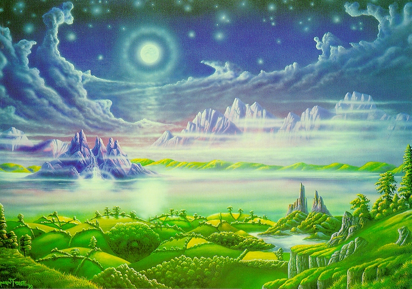 . . new Jerusalem” to settle upon. This, the “third coming” of Chist, will be the first time the Lord’s “feet” shall touch the earth since “he was taken up: and a cloud received him” (Acts 1:9) at the time of his ascension. Even though at His second coming He will come “with clouds” (Revelation 1:7) He will not set foot on the earth. Instead, the saints will be “caught up together . . . in the clouds, to meet the Lord in the air” (1 Thessalonians 4:17) after which they will reign “with Christ a thousand years” (Revelation 20:4). In the meantime, the earth lay dormant, desolate (accept for the brooding presence of Satan and his angels) and forlorn, waiting, as it were, for its eventual restoration to the Edenic likeness depicted in verse 1 of this chapter. So, while the second coming was incredibly awesome, the third coming stretches the imagination beyond the breaking point. There we see this immense “city” preceded by “Christ [as He] descends upon the Mount of Olives, whence, after His resurrection, He ascended, and where angels repeated the promise of His return . . .” “‘. . . and the Mount of Olives shall cleave in the midst thereof . 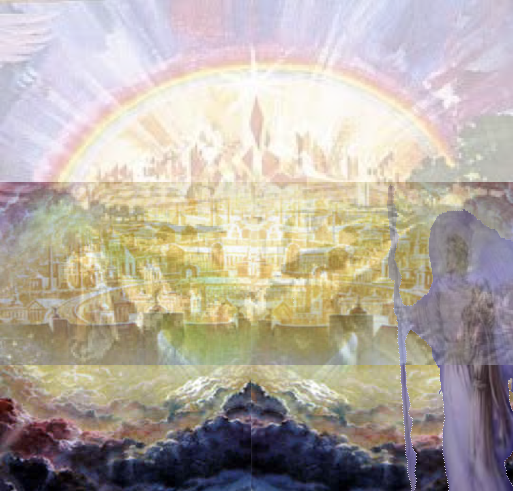 . . and there shall be a very great valley. . .’ “the New Jerusalem in its dazzling splendor, comes down out of heaven, it rests upon the place purified and made ready to receive it, and Christ, with His people and the angels, enters the Holy city.” WOW! The Commentary points out that “the speaker is not identified” and “is presumably not God, for He is spoken of in the third person.” But, in Revelation 12:12 it appears that the same “great voice from heaven” invited the “two witness” to “come up hither. And they ascended up to heaven in and cloud.” Then in Revelation 16:1, 17 it commanded “the seven angels” to “pour out the vials of the wrath of God upon the earth” after which it declares: “It is done.” In both cases, the “voice” came “out of the “temple in heaven” which “was filled with smoke from the glory of God” (Revelation 15:8) after “one like unto the Son of man” had left the temple and had taken His place on the “white cloud” in Revelation 14:14. Therefore, because these scenes are all post probational and due to the nature of these commands, it seems likely this is the voice of God Himself. Note, they are also spoken of in the third person. Just after He “created man in his own image” back in the beginning of time He spoke to Adam and Eve face-to-face inviting them to “Be fruitful, and multiply, and replenish the earth and subdue it: and have dominion over the fish of the sea, and over the fowl of the air, and over every living things that moveth upon the earth” (Genesis 1:28). In this post millennial situation, it seems that the earth will have been sufficiently replenished with the saved people of all the ages of history so the procreation will be discontinued. Christ Himself said that after “the resurrection they neither marry, nor are given in marriage, but are as the angel of God in heaven” (Matthew 22:30). Evidently, we will not be raising families, but will be one big happy family with God the Father, God the Son and God the Holy Spirit at the head. In that case, the immense numbers of the heavenly family will remain finite. And since time will be infinite, eventually every member of the family will be well acquainted with each other. None will be strangers unlike our present situation where nearly all are strangers to each other. Ever since that time, God has been seeking ways to “dwell among” men who cannot live in His presence. He instructed Moses to build “a sanctuary; that [He might] dwell among them” (Exodus 25:8). But, that “sanctuary” was just a pattern of the sanctuary in heaven “the true tabernacle, which the Lord pitched and not man” (Hebrews 8:2). 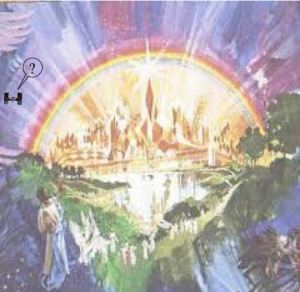 When Christ died, “the veil of the [earthly] temple was rent in twain from the top to the bottom” (Matthew 27:51; Mark 15:38; Luke 23:45) by the angel of God signifying that the “most holy place of the earthly sanctuary is no longer sacred.” Since that time, God’s people can approach him one-on-one in the heavenly sanctuary without the assistance of a human priest. In fact, “Christ may dwell in your hearts by faith” (Ephesians 3:17) and become “closer than a brother” (Proverbs 18:24) through the agency of the Holy Spirit Jesus called the “Comforter” (John 14:16, 26; 15:26; 16:7) who testifies of Jesus. This is the second and last time God will have to “wipe away all tears from their eyes.” A thousand years before, “God [had wiped] away all tears from [the] eyes” of the “great multitude” who were “arrayed in white robes.” They had just come “out of [the] great tribulation” (Revelation 7:14), “a time of trouble, such as never was since there was a nation, even to that same time” (Daniel 12:1). They were rescued at midnight, “the darkest period of this earth’s history” when Satan worked “with all power and ‘with all deceivableness of unrighteousness’ . . . the great apostasy [had developed] into darkness deep as midnight, impenetrable as sackcloth of hair. To God’s people it [had been] a night of trial, a night of weeping, a night of persecution for the truth’s sake.” Just at the moment they were to suffer death at the hands of the wicked, “the great [metaphoric] river Euphrates [was] dried up” when the “sixth [plague bearing] angel poured out his vial” (Revelation 16:12). Nevertheless, the saints, who are still tender hearted will have had to bid their lamenting loved ones a tearful farewell because they take no pleasure in witnessing their destruction in the lake of fire depicted in Revelation 20:14, 15. Therefore, it is little wonder “God shall wipe away all tears from their eyes.” Perhaps the saints will even have to wipe away tears from the eyes of God! “As I live, saith the Lord God, I have no pleasure in the death of the wicked” (Ezekiel 33:11) even though there is no hope of their turning away from the evil of their ways. Though they fully acknowledge the justice and absolute necessity of the fearful, postmillennial executive judgment, and while it was fearfully painful for many of the wicked, it was also a very painful thing for the saints to witness. But, from that time forth “there shall be nor more death, neither sorrow, nor crying, neither shall there be any more pain; for the former things are passed away” forever, and ever, and ever! Verse 5: And he that sat upon the throne said, Behold, I make all things new. And he said unto me, Write: for these words are true and faithful. This takes us back to the “new heaven and a new earth” depicted in verse 1. “He that sat upon the throne” is the creator who sat on the “great white throne . . . from whose face the earth and the heaven fled away” after “fire came down from” Him “out of heaven, and devoured,” not only “Gog and Magog” but the entire earth in one vast “lake of fire” (Revelation 20:10, 14, 15). Viewed from a distance in space would make its appearance as a new neighbor in the family of stars. This would be a very strange sight with a tiny, brilliantly lit orb circling around the much larger star we call the sun. Then “’the elements [will] melt with fervent heat, the earth also, and the works that are therein are burned up.’ The earth’s surface [will become] one molten mass . . .” Having subjected the globe to His celestial blast furnace, He will, as it were, pour the molten mass into the ingot of His plan to recreate the world anew as it was before Noah’s flood. But, it will even be better than that because, in the midst of the new earth will be the marvelous city called, according to verse 2, the “New Jerusalem.” At first the earth’s surface was “broken and uneven,” having been subjected to “a great earthquake, such as was not since men were upon the earth, so mighty an earthquake, and so great” (Revelation 16:18). Jesus, the “alpha and omega” of Revelation 1:8, 11 declares what “a great voice out of the temple of heaven” said a “thousand years before” in Revelation 16:17 when “the seventh [plague bearing] angel poured out his vial into the air. That was God the Father who remained in the “temple” (Revelation 15:8) while “one . . . like unto the Son of man” took His place on the great “white cloud . . . having on his head a golden crown, and in his hand a sharp sickle” (Revelation 14:14). What was “done” then was the completion of the pre millennial executive judgment followed by the second coming depicted in Revelation 6:14-17. What was “done” here is the completion of the post millennial executive judgment after the third coming. Now, in this verse, Jesus takes John back into the probationary time of the Investigative judgment when “the water of life” is “freely” offered to anyone who is thirsty. Those who avail themselves of this opportunity will at last “hunger no more, neither thirst any more; neither shall the sun light on them, nor any heat. For the Lamb which is in the midst of the throne shall feed them, and shall lead them into living fountains of waters: and God shall wipe away all tears from their eyes” (Revelation 7:16, 17). “He that overcometh” is one who “continually conquers, or habitually conquers.” The overcomer is represented by the “white horse” who “went fourth conquering, and to conquer” (Revelation 6:2). He “shall inherit all things” including the right “to eat of the tree of life” (Revelation 1:7) and avoid “the second death” (Revelation 2:11), obtain nourishment from “the hidden manna” and receive “a new name” (Revelation 2:17), gain “power over the nations” (Revelation 2:26), be made “a pillar in the temple” in heaven (Revelation 3:12), and be given a seat in God’s throne where Jesus sits because He “overcame” “even as we also” must overcome (Revelation 3:21). But, for the “unbelieving . . . the abominable . . . murderers . . . whoremongers . . . sorcerers . . . idolaters, and . . . liars . . .” there is no exception. While unbelief runs rampant in the world, anyone willing to use their eyes and ears can readily grasp “the invisible things of him from the creation of the world” because they are “understood by the things that are made, even his eternal power and Godhead; so that they are without excuse” (Romans 1:20). A place in heaven would be torture for “the abominable,” those who prefer that which is detestable, disgusting and noxious. “Murders” would be out of a job because “there shall be no more death” in the new earth and they would feel empty and powerless. “Whoremongers . . . them that defile themselves with mankind” (1 Timothy 1:10) would find nothing salacious in the new earth. “Sorceres” are “’practicers of magical arts.’ Basically, the root refers to magic, enchantment, sorcery, and to the use of drugs to produce a stupefied condition. A modern counterpart of the ancient practice of sorcery is spiritism.” Those dedicated to such practice would be drawn back to earth during the “thousand years” or outside the wall of the city thereafter where their god was living. “Idolaters,” whose devotion is closely related to sorcery, can practice their worship in a number of ways other than the worship of images. Any object of worship other than the true God falls under that category. “Liars,” those who not only speak lies, but live in an unreal world of their own making, would be severely disturbed, even terrified, to find themselves face to face with reality utterly impossible to escape in heaven. All, clinging to the fashions depicted in these categories, would be extremely unhappy in heaven. Our God of mercy, who even as we speak, is trying to change us “fearful, unbelieving, abominable, murderous, whoremonger, sorcerer, idolatrous and lying” people to be courageous, believing, pure, kind, upright, faithful to God, worshipping Him in truth. Then we will be very happy in heaven! This same angel, just a short time before, came to John “saying . . . Come hither, I will shew unto thee the judgment of the great whore . . .” (Revelation 17:1) which took place at the time of the second trumpet of Revelation 8:8,9 instead of the “third woe” or seven last plagues of chapter 16. Here, even though having “the seven vials full of the seven last plagues” he comes to show John Jesus’ “bride” called “the Lamb’s wife” called “the camp of the saints . . . the beloved city” in Revelation 20:9 which had been the home of the saints for the previous “thousand years” long after the “seven last plagues” of chapter 16 had been poured out. Its as if this angel, sympathizing with the plight of the saints who had witnessed the “judgment of the great whore” and who had experienced “hunger, thirst” and intense “heat” during the plagues he and his fellows had poured out, had endured them patiently living in the hope that soon “the Lamb which is in the midst of the throne shall feed them, and shall lead them unto living fountains of waters: and God [would soon] wipe away all tears from their eyes” (Revelation 7:16, 17). Previously, in Revelation 17:3, this same same angel “carried” him “away in the spirit into the wilderness” representing a desolate portion of the earth. Here, although it is simply a vantage point from which he could observe the details of the city, he is “carried . . . to a great and high mountain” on the earth that had been subjected to “a great earthquake, such as was not since men were upon the earth, so mighty and earthquake, and so great” (Revelation 16:18). It must have been one of the “mountains” that “trembled, and all the hills moved lightly” (Jeremiah 4:23). After a millennial of time had transpired, perhaps things will have settled down. While “they that dwell on the earth shall wonder, whose names were not written in the book of life from the foundation of the world, when they behold the beast . . .” (Revelation 17:8) none of them will be alive to “behold” this scene because it precedes the second resurrection. The saints, on the other hand, will have already been living in the city for the past “thousand years.” But, even to them, it will be a most beautiful and unusual sight to see it “descending out of heaven from God.” Perhaps we with John, who already witnessed this scene in vision, will also stand on the top of this same “great and high mountain” to observe the spectacle in actuality! Verses 11 to 13: Having the glory of God: and her light was like unto a stone most precious, even like a jasper stone, clear as crystal; And had a wall great and high, and had twelve gates, and at the gates twelve angels, and names written thereon, which are the names of the twelve tribes of the children of Israel: On the east three gates; on the north three gates; on the south three gates; and on the west three gates. All three of these verses make up one sentence suggesting John could barely contain himself while exuberantly writing out the details of what he saw. Not much can be added to this lovely picture except to say that previous stones, valued for their unparalleled beauty, comes the closest to depicting the extraordinary beauty of the holy city. And, no wonder, the architect is God who loves beauty. As the city descends from the sky it sparkled with every color of the rainbow like a multicolored, transparent jewel. Since “the names of the twelve tribes of the children of Israel” are “written” on its “twelve gates,” we wonder if only one name is given to each gate or if all twelve are written on each of them. If they were, they would total 144 names with each being repeated twelve times, perhaps as a commemoration of the 144,000 depicted in Revelation 7 and 14. Note also it four walls facing “east . . . north . . . south . . . and . . . west . . .” “the four quarters of the earth” from which “Gog and Magog” gathered themselves “together to battle: the number whom [was] as the sand of the sea” (Revelation 20:8). Although the gates had remained open during the time they were preparing for war, when “the order to advance is given” by Gog, “By the command of Jesus, the gates of the New Jerusalem are closed, and the armies of Satan surrounded the city, and make ready for the onset.” That is the only time the “gates” will ever be closed. Therefore, the “foundations” supported each section of the walls between each of its twelve gates with no foundation under the gates themselves. Again we wonder if the names of all twelve apostles were on each section, or only one name on each of the twelve. Interestingly, while the names of Dan and Ephriam are likely missing on the gates, very likely, Judas’ name will also be lacking on the foundations. With the names of the 144,000 on the gates and “the names of the twelve apostles” on the foundations suggests a symbiotic, or cooperative relationship between them. While the “twelve apostles” laid the groundwork of the gospel, the 144,000 carried it forth to completion. In spite of two thousand years separating them, we can see that Christ’s apostles established the foundation of the Christian church while Jesus, though the instrumentality of the 144,000, had finished the work. They were Christ’s last day apostles who were sealed just before the sounding of the seven trumpets after the investigative judgment had just turned from the dead to the living when the “fifth seal” (Revelation 6:9-11) had been opened. They, in spite the threat of economic sanctions, imprisonment, and even death, followed “the Lamb whithersoever he goeth . . .” Thus, they became “the firstfruits unto God and to the Lamb” (Revelation 14:4) as they gave earth’s final three angel’s messages saying: “Fear God, and give glory to him; for the [final] hour of his [investigative] judgment is come . . . Babylon is fallen” and have nothing to do with “the beast . 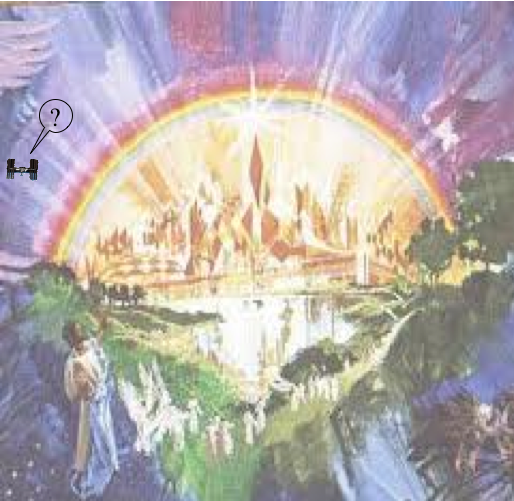 . . image” or “his mark . . .” (Revelation 14:6-9). They warned that “Babylon . . . is become the habitation of devils, and the hold of every foul spirit, and a cage of every unclean and hateful bird.” Therefore “Come out of her, my people, that ye be not partakers of her sins, and that ye receive not of her plagues” (Revelation 18:2,4). In that manner they had opened the “gates,” as it were, of the holy city to the “great multitude, which no man could number, of all nations, and kindreds, and people and tongues” (Revelation 7:9) “which came out of” or survived the “great tribulation” (Revelation 7:14) represented by the seven trumpet scenario. In effect, they became the “stone” that God “cut out of the mountain . . . and that it brake in pieces the iron, the brass, the clay, the silver, and the gold” (Daniel 2:45) of the great image Daniel and the king saw in the dream God gave them more than 4,000 years before. Verse 15: And he that talked with me had a golden reed to measure the city, and the gates thereof, and the wall thereof. This is the second time a “reed” is referred to. In Rev. 11:1 it is a figurative representation of God’s law to measure the character of His church depicted as “the temple of God, and the altar, and them that worship therein.” Here, because of the real numbers called out in the next two verses, the “reed” should be understood literally. Perhaps John was having trouble believing his eyes. Thus, the angel sought to substantiate the reality of what he saw. But, that was not just John’s problem. We too are tempted to doubt what we read here. But, “A fear of making the future inheritance seem too material has led many to spiritualize away the very truths which lead us to look upon it as our home. Christ assured his disciples that he went to prepare mansions for them in the Father’s house. Those who accept the teachings of God’s Word will not be wholly ignorant concerning the heavenly abode. And yet, ‘eye hath not seen, nor ear heard, neither have entered into the heart of man, the things which God hath prepared for them that love him.’ [1 COR. 2:9.] Human language is inadequate to describe the reward of the righteous. It will be known only to those who behold it. No finite mind can comprehend the glory of the Paradise of God.” Nevertheless, we can be certain that it is real! Verse 16: And the city lieth foursquare, and the length is as large as the breadth: and he measured the city with the reed, twelve thousand furlongs. The length and the breadth and the height of it are equal. This is the only time in the New Testament the word “foursquare” is used. It is from “tetragonos” meaning “quadrangular” or “square.” Since the “length, breadth” and “height . . . are equal,” many conclude the city is cubical. The “twelve thosuand furlongs” is approximately equivalent of 1,378 miles! A quarter of that figure for each side comes to 344 miles making its base ‘roughly the size of New Mexico.” Since its “height” is “equal” to its sides, 344 miles is higher than the altitude of the international space station that now orbits the death with an altitude of some 250 miles! A cube of such gargantuan proportion would be utterly spectacular, but rather bizarre. However, it is unnecessary to conclude it is cubical. It seems far more likely the city will assume the general shape of a mountain. There are many references to “the mountain of the Lord’s house; the mountain of his holiness; the mountain of the Lord; my holy mountain; the mountain of God” in the Bible. Therefore, it is wholly consistent with scripture to picture the holy city in that manner with its summit, extending into what we call “space,” being much smaller than its square base. Verse 17: And he measured the wall thereof, an hundred and forty and four cubits, according to the measure of a man, that is, of the angel. This “measure,” “by human measurements, which the angel was using”(NEB), is equal to “two hundred and eighty-five feet” (TNTC) which is probably its height, far less than the height of the city. Verses 18, 19, 20: And the building of the wall of it was of jasper: and the city was pure gold, like unto clear glass. And the foundations of the wall of the city were garnished with all manner of precious stones. The first foundation was jasper; the second, sapphire; the third, a chalcedony; the fourth, an emerald; The fifth, sardonyx; the sixth, sardius; the seventh, chrysolite; the eighth, beryl; the ninth, a topaz; the tenth, a chrysoprasus; the eleventh, a jacinth; the twelfth, an amethyst. The whole city, being made of “pure gold, like unto clear glass” with its walls composed of, what to us is rare but ordinary in heaven, suggests openness coupled with a degree of beauty such as is difficult if not impossible to imagine. There will be nothing to hide in heaven, consequently there will be no shame. All will live comfortably in houses with transparent walls. None will look suspiciously on his neighbor neither will envy nor covetousness be found there. None will fear the loss of property and nobody will need to lock their doors. Nevertheless, because there are buildings with “many mansion” (John 14:2) and “houses” that the redeemed themselves “shall build . . . and inhabit” (Isaiah 65:21) with roofs and walls and rooms: enclosures suggesting that personal privacy will still exist throughout eternity in spite of the unprecedented degree of transparency. Verse 21: And the twelve gates were twelve pearls; every several gate was of one pearl: and the street of the city was pure gold, as it were transparent glass. Most of us picture gates to be flat and generally rectangular. But “pearls” are generally spherical causing us to wonder how a spherical article can function as a gate! But, with God, there is no limit to His power. He could use a sphere for a gate and it would be very beautiful as well as functional. He could also create a flat gate out of pearl material if He so chose. He is not dependent on oysters to produce them! The resplendency of the “city” is augmented by its streets of pure, transparent gold, a material, even in its opaque form, is of enormous value to us and would never be considered for use as pavement, of all things! But, with God, there is no limit to that which is precious. Verse 22: And I saw no temple therein: for the Lord God Almighty and the Lamb are the temple of it. In other words, the “temple” will be personalized. God counseled Moses to build “me a sanctuary; that I may dwell among them” (Exodus 25:8). But, that is not good enough for God because He is looking forward to the time He Himself “shall dwell among them” (Revelation 7:15) without the necessity of four opaque walls between them. “Why were they [the 144,000] so specially singled out? Because they had to stand with a wonderful truth right before the whole world, and receive their opposition, and while receiving this opposition they were to remember that they were sons and daughters of God, that they must have Christ formed within them the hope of glory.” Therefore, this special honor accorded with an exclusive tour of the heavenly temple, will be allowed because they had remembered “that they were sons and daughters of God” in spite of the tremendous “opposition” they had to face while on earth, not only during the time of the “fifth and sixth seals,” but during the time of the trumpets after the “censer” was “cast into the earth” (see Revelation 6:9-11; 7:4-8, 14; 8:5 and onward). Verse 23: And the city had no need of the sun, neither of the moon, to shine in it: for the glory of God did lighten it, and the Lamb is the light thereof. Verse 24: And the nations of them which are saved shall walk in the light of it: and the kings of the earth do bring their glory and honour into it. We would like to think all nations and all “the kings of the earth” will be saved and “bring their glory and honour” to the holy city. But, only those “which are saved shall walk in the light of it.” Others, which became “angry” when “the third woe” (Revelation 11:14, 18) came, and those who drank “of the wine of the wrath of” the great whore’s “fornication” (Revelation 14:8, 18:3) will be absent. Only “the nations . . . and the kings of the earth” “which are saved” will have the privilege of bringing “their glory and honour into it.” They will be them “that overcometh, and keepeth [God’s] works unto the end, to [them] will [Jesus] give power over the nations” (Revelation 2:26). They will be “a great multitude, which no man could number, of all nations . . . who stood before the throne, and before the Lamb, clothed with white robes, and palms in their hands” (Revelation 7:9, 10). Nevetheless, “all nations shall come and worship before [God” when His “judgments are made manifest” during postmillennial time. Some will be inside the “great and high” “wall” (Revelation 21:7) of the city, many will be outside (Revelation 21:8). Whether inside or outside “every knee shall bow to me, and every tongue shall confess to God” (Romans 14:11). Verses 25 to 27: And the gates of it shall not be shut at all by day: for there shall be no night there. And they shall bring the glory and honour of the nations into it. And there shall in no wise enter into it any thing that defileth, neither whatsoever worketh abomination, or maketh a lie: but they which are written in the Lamb’s book of life. Summary of chapter 21: This chapter is clearly sequential with chapter 20 which ended with the post millennial lake of fire. Following that global cataclysm, we are then introduced to the earth made new after the cleansing fire had completed its work and the announcement is made that God will, from that point on personally dwell with His people throughout eternity during which life will be unimaginably joyful with all sin, suffering ceasing to exist. Then, John does a little back tracking when he was taken up to the top of a high mountain to witness the descent of the holy city from heaven followed by the angel giving its enormous dimensions as if to reassure all that this city is literal. Its beauty, garnished with all manner of precious stone work, coupled with its basic structure of pure, transparent gold exceeds the power of imagination to visualize. Thus, with such description, all are invited to be there by having our names “written in the Lamb’s book of life. remember, the “pre millennial executive judgment” is represented by the seven trumpets of Revelation 8:7-9:21; 11:7-19; 15:1, 5-8; 16:1-21. The “post millennial executive judgment” depicted in Revelation 20 comes after the “thousand years” have expired. The word “sorcerers” is from “pharmakeus” (Strong’s #5332) “one who prepares or used magical remedies.” A nearly identical word “pharmakeus” in Revelation 22:15 is also translated from “pharmakeus” but it is given the number “5333” instead of “5332.” Those are the only two places the word is found in the New Testament. The “sorcerer” of Acts 13:6, 8 is from “magos.” In the Old Testament, “sorcerers” in Exodus 7:11 is from “kashaph” (Strong’s #3784); in Jeremiah 27:9 from “kashshaph” (Strong’s #3786); in Daniel 2:2; Malachi 3:4 from “kashaph” (Strong’s #3784). They all refer to the same thing, the practice of magical arts inclusive of the compounding of mind altering drugs which is probably one of the greatest scourges of modern society as well as the ancient, with alcohol being the number one intoxicant. Note that all the overcomers depicted in verse 7, have to wrestle with all of these things. Nobody is immune from the temptations in any of these categories. This is not “brain washing” or forced change on an unwilling subject. For example, see Exodus 19:3; Ps.48:1; Isaiah 2:2; 30:29; 56:7; 57:13; 65:11; 65:25; Ezekiel 28:14, 16; Daniel 9:20; Joel 3:17; Obadiah 1:16; Micah 4:1, 2; Zephaniah 3:11; Zechariah 8:3.